I should be in Warsaw today on a three-day visit to the Polish capital. This would have been my second visit to Poland, following a city break in Kraków and Auschitz at the end of 2016. But the ‘Beast from the East’ and ‘Storm Emma’ made a motorway journey to the airport too risky yesterday afternoon, and Warsaw has gone onto my wish list. Despite the considerable number of Poles in Ireland – 122,515 people or over 2.5 per cent of the population, and to a lesser degree in Britain – over 900,000 people or 1 per cent of the population, many of us on these islands remain largely unaware of Polish history or culture. Despite the interesting Polish presence here, we are more likely to know about Spain, France, Italy and Greece. How many of us can count famous or historical Polish figures on the fingers of two hands, or even one hand? The who come to mind, for me, include: the astronomer Nicolaus Copernicus (1473-1543); the composer Frederick Chopin (1810-1849); the writer Joseph Conrad (1857-1924); Marie Curie (1867-1934), who developed the theory of radioactivity; the revolutionary Rosa Luxemburg (1871-1919); the exiled General Władysław Sikorski (1881-1943), who gave his name to fleet of helicopters; the writer Isaac Bashevis Singer (1902-1991), who was a Nobel laureate; Joseph Rotblat (1908-2005), the physicist, CND activist, disarmament campaigner and a Nobel Peace Prize laureate; Lech Walesa, the leader of Solidarity; and Karol Wojtyla (1920-2005), who became Pope John Paul II. But who remembers that the broadcaster Jacob Bronowski (1908-1974), the Warner Brothers or the pianist the pianist Arthur Rubinstein (1887-1982) were Poles too? Or Menachem Begin, David Ben-Gurion and Zbigniew Brzeziński (1928–2017), Jimmy Carter’s national security adviser? And few Irish people probably know about the Baal Shem Tov, the mystical rabbi who is regarded as the founder of Hasidic Judaism. I was mistaken when I thought the painter Marc Chagall was Polish. But perhaps Irish people might add the Polish playwright and painter Casimir Dunin Markievicz (1874-1932), who styled himself Count Markievicz and was the husband of Constance Markievicz – he moved to Ukraine in 1913, ands died in Warsaw in 1932. I think, perhaps, that Greek people are more conscious of the links Poland and Greece share than people in Ireland are aware of the two-way links between Poland and Ireland. On the best-known Poles in modern Greek history and politics was Zygmunt Mineyko (Ζίγκμουντ Μινέικο), a Polish aristocrat who was the father-in-law, grandfather and great-grandfather of three Greek Prime Ministers. Zygmunt Zygmunt (1840-1925) was born into a prominent aristocratic Polish-Lithuanian, land-owning family. One of his ancestors was a signatory of the Union of Horodło in 1413, and the family owned many estates in what are now Poland and Belarus. Mineyko enrolled in a Russian military academy in Saint Petersburg in 1858, but he returned home in 1861 to spread anti-Russian agitation among the Polish and Belarusian population. He then escaped to Italy, where he taught at a military school in Genoa established by Garibaldi, but he returned home when an uprising against the Russian Empire began in 1863. Mineyko was arrested and sentenced to death, but he escaped the death penalty and was sent into exile in Siberia. He escaped on an English ship in 1866 using the alias of Count von Meberthe. In Paris, he met Napoleon III, secured the release of French prisoners in Siberia when the Tsar Alexander II visited France in 1868, and went on to study at École Militaire in Paris. With a degree in civil engineering, Mineyko worked briefly in Morocco before moving to the Ottoman Empire, where he worked on building railways, bridges and channels in Bulgaria, Turkey and in Epirus and Thessaly, then Ottoman provinces that were later incorporated into the modern Greek state. During this time, he made a sensational archaeological discovery at the ancient sanctuary of Zeus in Dodona, and established close links with the Greek intelligentsia. In 1880, Mineyko married Persephone Manaris, the daughter of a renowned Greek mathematician Spyridon Manaris of Ioannina, once the seat of the formidable Ali Pasha (1740-1822). The family moved to Athens when Mineyko was appointed chief engineer in the Greek Ministry of Public Works in 1891. He was also a member of the executive committee for Crete in 1896, and in 1897 he was appointed head of the topographic section of the Greek Army’s general staff. Mineyko took part in the revival of the modern Olympic Games, and was involved in restoring the Panathenaic Stadium in Athens, the venue for the first modern Olympics in 1896. During the Games, he reported from the stadium for the Polish newspaper Czas, and for many years he wrote on Greek politics for Polish periodicals in Kraków and Lwow. 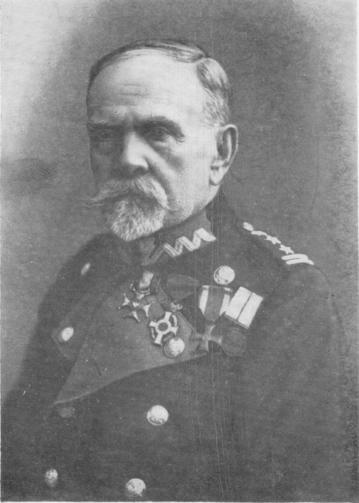 Mineyko took part in the Greek-Turkish war in 1897. In 1910, he was granted honorary citizenship by the Greek Parliament. Despite his age, at 72 he took part in the First Balkan War, which began in 1912. His strategic plans were crucial in the decisive Greek victory at the battle of Bizani in 1913, leading to the Greek capture of Ioannina, his wife’s home town, and Epirus. Politically active, he was a strong supporter of the Greek Prime Minister Eleftherios Venizelos, founder of the Greek Liberal Party, who was the key figure in the unification of Greece in 1913. A heart attack forced Mineyko’s resignation in 1917. After Poland regained independence in 1918, he helped establish diplomatic relations between Greece and Poland, and convinced Venizelos to support the Polish cause in the international arena. In 1922, Mineyko visited his homeland which had become a part of the Second Polish Republic. There he was made an honorary colonel and received an honorary doctorate. When his wife Persephone Manaris learned about the rise of a newly-independent Poland, she began to sell her property and planned to move to Kraków. But her dream never saw the light of day: Zygmunt Mineyko died in Athens on 27 December 1925. Mineyko’s memoirs are held in the Library of the Jagiellonian University in Kraków, and his memoirs were published in Polish in Warsaw in 1971. Their son, Andreas Papandreou (1919-1996), who was born on Chios, was a Harvard-educated economist, socialist politician, and Prime Minister of Greece in 1981-1989 and 1993-1996. Andreas Papandreou visited General Wojciech Jaruzelski in Poland in 1984. There, it is said, he was told that Balvanishki, his grandfather’s home village in Soviet Belarus, no longer existed. In fact, the name of the village had been changed to Zyalyony Bor during the Khrushchev era. In a poll conducted by the Greek newspaper Kathimerini in 2007, the first four years of Papandreou’s government were voted the best government Greece has ever had. Andreas Papandreou’s son and Zygmunt Mineyko’s great-grandson, George Papandreou, who was born in 1952, became the third member of the Papandreou family to become Prime Minister of Greece (2009-2011). His brother is the writer Nick Papandreou, a former economist at the World Bank. Both Nick Papandreou and I were visiting lecturers at the seminar ‘The Emergence of Modern Greece,’ organised by the Durrell School in Corfu in May 2006. I remember how, on the occasion too, a planned journey was also cancelled, when unusual weather for early summer forced the organisers to call off the ten-minute boat trip to the tiny island of Vidos for the closing dinner. I ought to be in Warsaw this morning, on a short city break in the Polish capital. But the weather conditions in Ireland and the risks involved in travelling on the motorway to the airport means that visit has been called off. However, I am continuing my Lenten journey in which, each morning in Lent, as part of my meditations and reflections for Lent this year, I am being guided by the Stations of the Cross from three locations. The idea for this series of morning Lenten meditations came from reading about Peter Walker’s new exhibition, ‘Imagining the Crucifixion,’ inspired by the Stations of the Cross, which opened in Lichfield Cathedral last month and continues throughout Lent. In the third station by Liam Cosgrave in Millstreet, Jesus is alone in the city streets as he falls to his knees beneath the weight of the cross. This is one of the traditional Stations of the Cross that depict Passion scenes that are not recalled in any of the Gospel accounts. Cosgrave’s stations are marked by their simple lines and their uncluttered compositions. In this station, unlike others, we see know soldiers goading Christ as he falls, jeering his efforts to stand again; no-one looks on in horror; no one offers to help in charity. In the Millstreet stations, it is a stark and lonely journey to Calvary. Tomorrow: Station 4: Jesus meets his mother.